MONROVIA, Calif., Feb. 8, 2007 --[ASDWire]-- AeroVironment, Inc. (AV) (NASDAQ: AVAV), a leader in unmanned aircraft systems and efficient electric energy systems, today announced that it has successfully completed sea trials of its Aqua Puma unmanned aircraft system (UAS) for the Royal Australian Navy to explore adding a UAS capability to the Navy’s new Armidale class patrol boats. AV’s Aqua Puma is launched by hand, lands directly onto the sea surface and is recovered by hand from vessels. It is a next-generation FQM-151 Pointer, with the same form factor but increased endurance (1.5 hours) and enhanced sensor capability. Bayraktar said that last year the company selected XTEK Ltd. as its representative for small UAS sales and logistics support in Australia, New Zealand and surrounding nations. This selection allows AV to provide full service, in-country support for Australian system sales, operator training and repairs. AV and XTEK are currently providing a full-spectrum of timely product and customer support to the Australian Department of Defence, which has been using AV’s RQ-11 Raven UAS since their procurement in 2005. The Raven UAS provides dismounted troops with organic Reconnaissance, Surveillance, and Target Acquisition (RSTA) capability in day and night operations. Building on a history of technological innovation, AV designs, develops, produces, and supports an advanced portfolio of Unmanned Aircraft Systems (UAS) and efficient electric energy systems. The company's small UAS are used extensively by agencies of the U.S. Department of Defense and increasingly by allied military forces to deliver real-time reconnaissance, surveillance, and target acquisition to tactical operating units. AV’s PosiCharge® fast charge systems eliminate battery changing for electric industrial vehicles in factories, airports, and distribution centers. For more information about AV, please visit www.avinc.com. AeroVironment's Aqua Puma small unmanned aircraft system (SUAS) is hand-launched from HMAS Armidale. 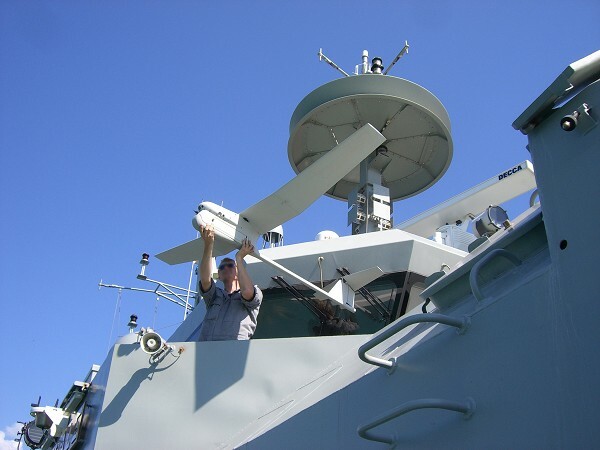 AeroVironment successfully completed sea trials for the Royal Australian Navy to explore adding a UAS capability to their new Armidale class patrol boats.